The long-billed dowitcher (Limnodromus scolopaceus) belongs to the family of snipes and dowitchers, Scolopacidae. The long-billed dowitcher species are distributed in North America, central America, Japan and eastern Siberia. Vagrant dowitchers have been observed in India, southeast Asia, Europe and Africa. These dowitchers are monotypic species. The long-billed dowitcher (Limnodromus scolopaceus) is a medium-sized dowitcher, measuring 25 to 30 cm in length and weighing 90 to 150 grams. The wingspan is 45 to 50 cms. The adult long-billed dowitcher has different alternate (summer, breeding) and basic (winter) plumages. The juveniles have brown head and breast with scattered spots. In summer adult long-billed dowitcher, the upperparts are dark brown with buff and white streaking. The crown is dark brown with pale spots. The underparts are reddish. The throat and breast have black spots. The supercilium is reddish black, even and straight. The belly and flanks are barred white and rufous. The black feathers have black base and reddish edges. The wintering adult long-billed dowitcher has pale gray head and whitish supercilium. The upperparts are gray. The belly and undertail coverts are whitish. The bill is longish, straight and blackish brown. The irises are blackish and the eye-ring is whitish. The legs are dull yellow or yellowish-green. The call of the long-billed dowitcher is a high-pitched "keek" or "kik" sound. These long-billed dowitcher species are distributed in North America, northern South America, central America, northeastern Russia and Japan. Vagrant dowitchers have been observed in India, southeast Asia, Europe, Africa, southern South America and Middle East. In India, vagrants of these dowitcher species have been observed six times(Sharma et al. 2013). They have been observed in central Kerala, Gujarat and Punjab. The Important Bird and Biodiversity Areas (IBA) of long-billed dowitcher species in Mexico are Bay Santa María, Estero Cardonal, Ciénega of Tláhuac, Ensenada of Pavilions and Ciénegas del Lerma. The IBA of long-billed dowitchers in USA are Teshekpuk Lake-E. Dease Inlet, Bear River Bay UT02, Salton Sea, Chenier Plain and Coastal Prairie. The IBA in Honduras is El Jicarito. These long-billed dowitcher species do not normally occur in forest. These species normally occur in altitudes from 0 to 100 meters. 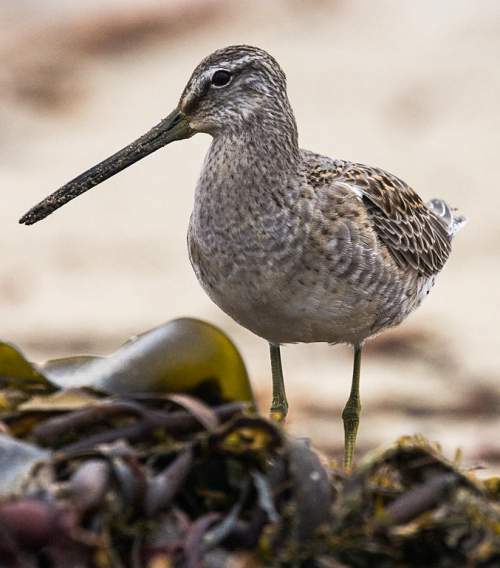 The natural ecosystems of these dowitcher species include wetlands, swamps and marshes in Arctic tundra, intertidal mudflats, intertidal marshes with emergent vegetation, freshwater lakes, bogs and peatlands. The diet of long-billed dowitcher consists mainly of insects. Beetles, small gastropods, crustaceans, worms and insect imagoes and larvae are their primary food. They also feed on seeds and other plant matter. These dowitcher species forage by probing in soft mud and shallow waters. These birds probe the ground for suitable prey with their long, sensitive bill. The breeding season of these long-billed dowitcher species is from May and August in most of their breeding range. These birds are monogamous and territorial. The males display by flying above the breeding sites. They breed in loose colonies. The breeding sites of these dowitcher species include margins of wetlands, bogs, tidal marshes, mudflats in tundra regions in northeastern Russia, north and east Alaska (USA) and northwestern Canada. The long-billed dowitcher species nest on the ground, usually near water. The shallow nest on grass or moss is lined with fine grasses, twigs and leaves. The clutch usually contains three to four eggs. Both the long-billed dowitcher parents incubate the eggs for about 21 days. The hatchlings have downy feathers and leave the nest soon after hatching. The chicks forage for the food, following the parent. These long-billed dowitcher species are fully migratory birds. The breeding populations are distributed in tundra regions in northeastern Russia, north and east Alaska (USA) and northwestern Canada. Post breeding, these dowitchers migrate to central America, northern South America and Japan for wintering. They return to their breeding grounds in early summer. The global population size of the long-billed dowitcher (Limnodromus scolopaceus) is estimated to number more than 400,000 individual birds. The overall population trend of these species is unknown. Throughout its range this dowitcher species is reported to be uncommon to common. The generation length is 5.8 years. Its distribution size is about 3,690,000 sq.km. Habitat alteration and destruction, climate change and severe weather are the main threats that may endanger the survival of these long-billed dowitcher species. The long-billed dowitcher (Limnodromus scolopaceus) does not approach the thresholds for being Vulnerable either under the range size criterion, or under the population trend criterion or under the population size criterion. 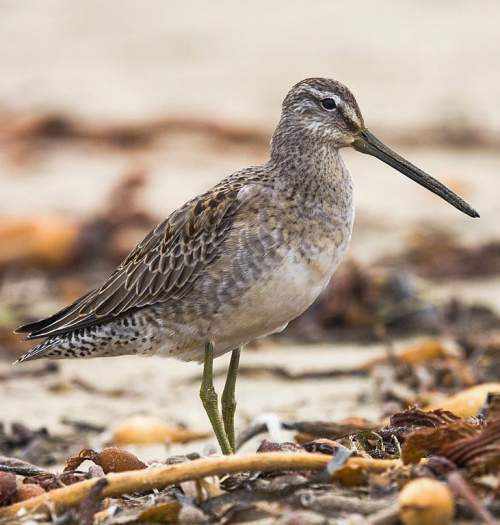 The IUCN (International Union for Conservation of Nature) has categorized and evaluated the dowitcher species and has listed it as of "Least Concern". The CITES (Convention on International Trade in Endangered Species of Wild Fauna and Flora) status is ‘Not Evaluated’ for long-billed dowitcher (Limnodromus scolopaceus). The long-billed dowitcher (Limnodromus scolopaceus) is closely related to the short-billed dowitcher (Limnodromus griseus). 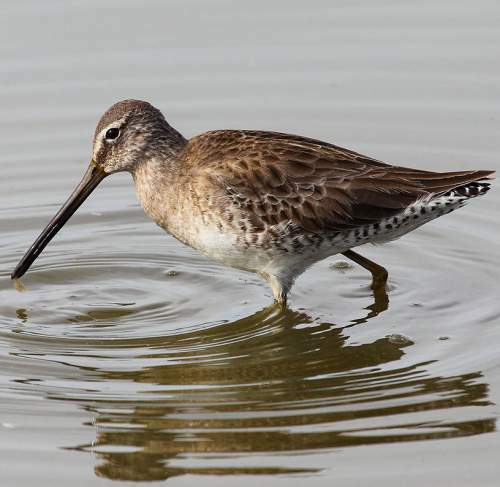 Current topic in Birds of India: Long-billed dowitcher - Limnodromus scolopaceus.